It's May! The month dedicated to mothers, and I am so ecstatic to be among that crowd, celebrating my second Mother's Day! After losing several pregnancies, one at halfway through, there was a point in time when I thought I was never going to be a mom. Then in 2015, God gifted me with my beautiful boy, and my shattered little heart was finally pieced back together. The torn paper represents my torn heart, and the twine has stitched it back up because now I have a whole heart again. 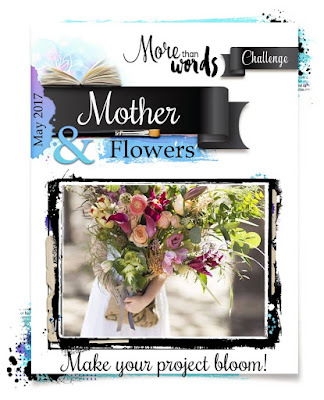 More Than Words May challenge is to scrap about a mother and use flowers. Being a mom is so special, I was inspired to celebrate the special relationship between mother and child, between myself and my son. 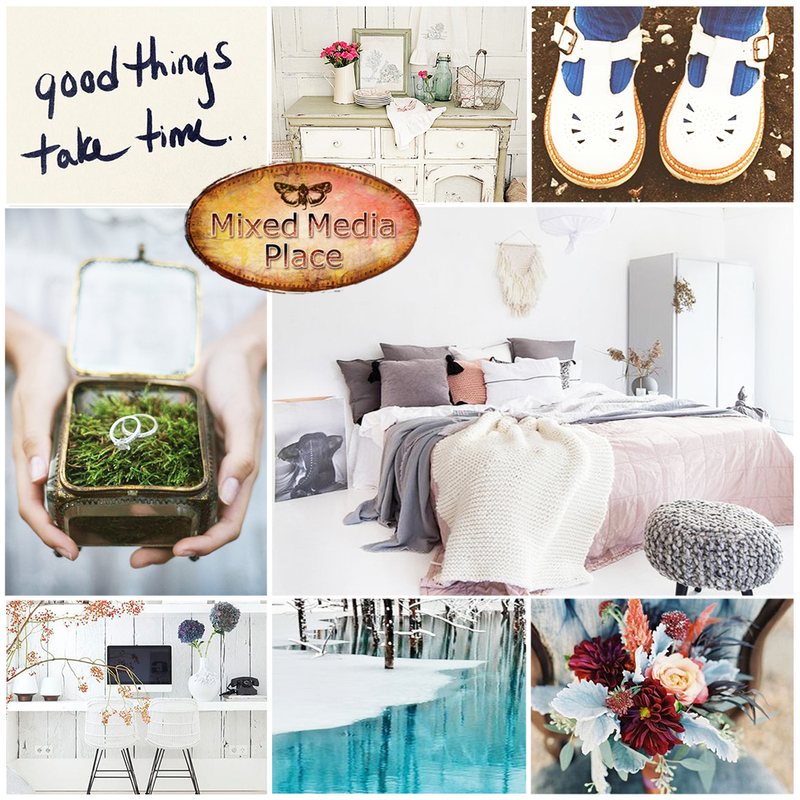 The mood board at Mixed Media Place inspired an overall theme of time. The sentiment especially spoke to me: GOOD THINGS TAKE TIME. That perfectly describes how I feel now: that this gift was worth waiting for--even if the wait was at times full of heartache. I also loved the blue color in those little shoes and the shabbified furniture, so I brought some of that shabbiness to the layout with some texture paste. 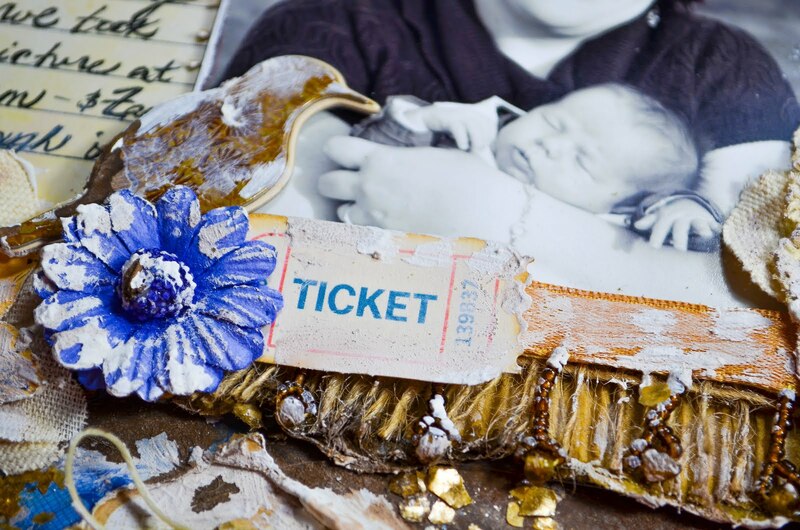 Since we did this first mommy and me photo shoot at our farm, I used some rustic elements like burlap flowers and twine, and the bird because that day the birds were singing like a disney movie. I used several references to clocks and time. 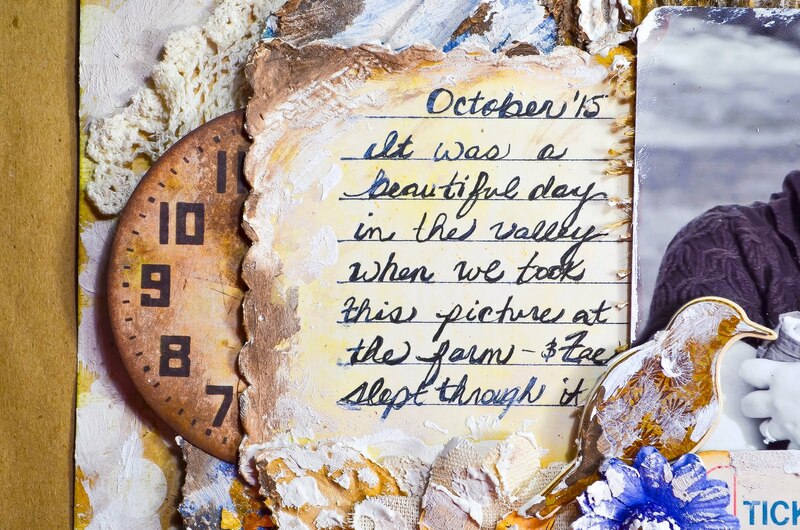 Remember this Tim Holtz ephemera clock from A Boy and His Cat? I was so happy to use the other half on this layout. The journaling is what I remember from that day out at the farm, shortly after he was born. It was a super hot day in mid-October, unseasonably warm for Minnesota. We spread a quilt under the big birch tree at the top of the meadow, which as the best view of the whole valley. Zae slept through the entire afternoon. I knew babies were cliche in their "eat, sleep, and poo" but I didn't realize how literal it was until I was flinging him around into different poses and he didn't even wink. I'd like to thank you all for stopping by and hanging out with me! I hope all the mothers out there enjoy their upcoming day, and that you are appreciated all the year long! oh great takes on the two challenges! I've always loved blue and yellow. 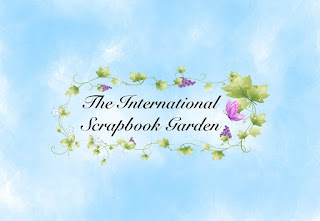 The meaning behind some of what you did on this layout are very touching. Beautiful layout Carrie! 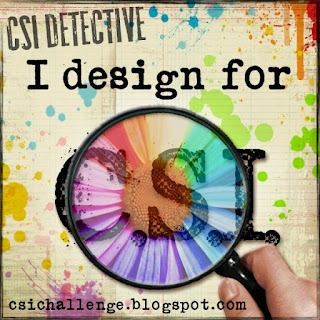 Another beautiful layout Carrie! What a touching story too! You are a beautiful and happy looking mother! So happy you could play along with us at More Than Words! Beautiful layout!!! It's such a beautiful story and so touching. Thanks for joining us at More Than Words! Love the story behind! Your LO is awesome! 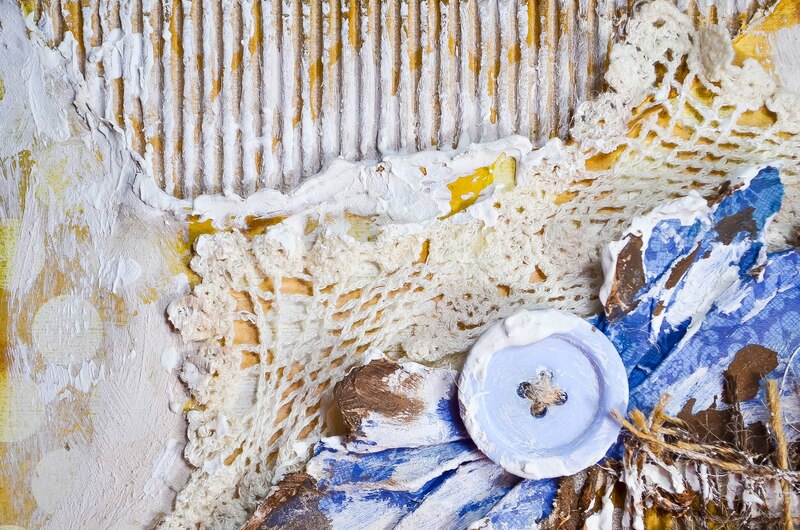 Thanks for playing along with Mixed Media Place. Thanks for playing with MMP!! Amazing Creation thanks for playing at MMP!!!! 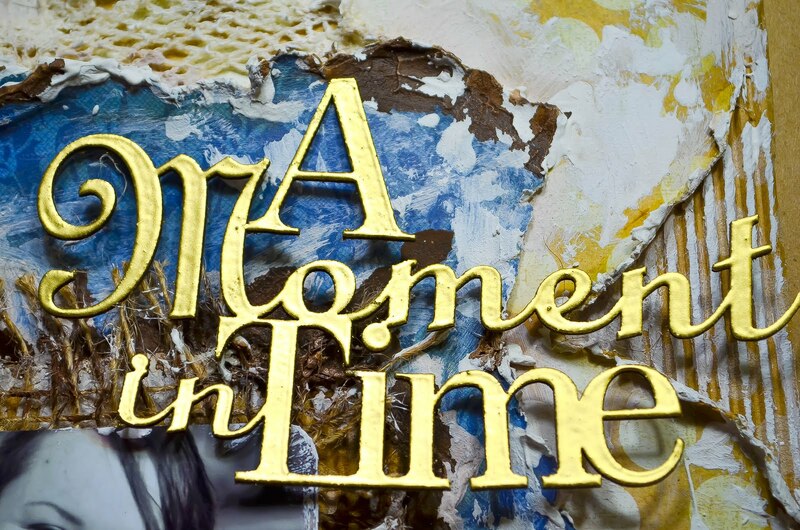 Awesome mixed media project!!! Beautiful mother!! Thank you so much for joining us at More Than Words!! Love this combo... 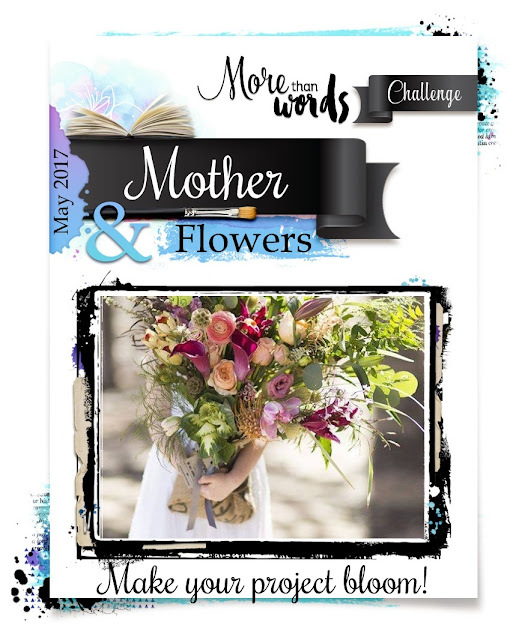 Thank you so much for joining us at More than Words Challenge.